On Monday 29th October I’ll be performing an improv set using found tapes, live sampling them via walkmans to make a collage of rhythm and drone. Also playing are Yumi Hara Cawkwell, Guy Harries, Illi Adato, Emily Shapiro and Valerie Pezeron. Full details below, FB even page here. 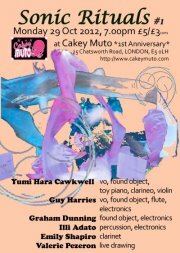 A multimedia performance of improvisation creating enigmatic, magical and ritualistic space and celebration of Cakey Muto’s 1st Anniversary.